Together with morbid obsessions, magical and superstitious thinking makes up one of the stranger and more misunderstood aspects of OCD. When my patients try to describe their symptoms, they preface their explanation with, “I know this sounds crazy, but….” The presence of magical thinking is probably the main reason why many with OCD have been misdiagnosed over the years as schizophrenic. Superstitious thinking makes strange and magical connections between things which logically don’t seem to connect in the real world, thus the apparent ‘craziness’. Some common examples would be the idea that thinking of an unlucky number can ruin your day, that clothing you wore to a funeral can lead to more unhappiness if you wear it again, or that thinking of the name of a disease will cause you or someone else to get that disease. Magic and superstition are as old as the human race. They have represented a way for us to try to explain the normally unexplainable, and to try to control the seemingly uncontrollable. They have, therefore, always held great allure and attraction. One might go as far as to say that there is a human tendency to think superstitiously. Just look, for example, at people playing their ‘lucky’ lottery numbers, or reading horoscopes to guide their lives. Clearly, OCD does not have a monopoly on such thinking. There are limits, however. The average person can find a place for a little superstition without it taking over and causing them to be unable to function. Even members of primitive societies, where magic dominates most important decisions, can tolerate its presence without becoming paralyzed by it. It is used as a tool and a guide. In OCD, we see magical thinking run amok, and out of control. Once it establishes itself as a symptom, it can grow like a cancer, starting as a way to relieve anxiety, and expanding to become the sufferer’s chief occupation and the cause of even greater anxieties than it was supposed to relieve. There is currently no scientific explanation as to why some individuals tend to have these particular symptoms, compared to any others. Many of those with OCD are constantly bombarded with very strange and doubtful thoughts about harm coming to themselves and/or others. Sufferers thus may feel that they cannot resort to ordinary protective measures, because of these extraordinary threats. Their world seems out of the range of normal control. They therefore turn to magic as the only other viable alternative, as a way of restoring a feeling of control. One other possible influence upon the development of magical thinking may be if an individual with OCD comes from a culture in which superstition plays a strong role. Coming from such a background cannot, of course, cause OCD; however, it can certainly help give someone at risk a push in the wrong direction if everyone at home is doing magical rituals. As we know, an obsession is any thought that causes anxiety, and a compulsion can be any action, either mental or physical, which relieves it. Obsessive thoughts generally tell sufferers that something harmful is happening, or will happen to themselves or someone else. Magical thinkers generally obsess about many of the same types of threats that other sufferers do: they themselves or others dying or becoming ill or disabled, being ‘cursed’, having bad luck, being blasphemous or sinful, going to hell, getting into trouble, or deliberately or accidentally harming others in some way, etc. The list could be much longer, if there were space. The thoughts don’t simply stop with a bad consequence being revealed to the thinker. They would otherwise be no different from morbid obsessive thoughts. What distinguishes them, is that they are also (as mentioned earlier) connected with some type of magical cause or attribution. Whether magical thinkers make this attribution themselves, or whether it is part of the obsession itself, is unclear. They come to believe, for instance, that the harm can be brought about by unlucky numbers or their multiples, by simply hearing about bad things happening to others, by thinking about or seeing certain words or images, by carrying out (or forgetting) certain actions or behaviors, by unlucky colors, by being ‘possessed’, or by contact with places, objects, or people associated with unlucky or unhappy occasions. Contact in this last case can be purely mental or physical. The most basic magical compulsions involve simple avoidance of the magically ‘bad’ words, numbers, objects, colors, persons, etc. We can call this avoidance magical because it is done in response to magical obsessions. Beyond avoidance is control. Perhaps because the harm is thought to have magical origins, the compulsions sufferers invent to control it are frequently also magical. There are more complex types of magical compulsions which resemble the practice of ancient magic and they tend to follow strict rules or precise steps, which if not performed perfectly, must be repeated. We commonly refer to these as ‘rituals’. These types of magic rituals are also referred to as ‘undoing rituals’. Magic, as we all know, must be kept ‘pure’ and perfect if it is to work. Because anxiety typically hampers most people’s performances at anything, it is, of course, difficult for sufferers to get rituals to be perfect. They tend to get the steps wrong, forget something, or have some type of unpleasant obsession or image intrude, thereby ‘contaminating’ or ruining the magic. When this happens, very high anxiety and depression can result. Unless their obsession allows them to have another chance to make things right, a great deal of careful activity can be ruined in an instant. If it is a ritual that can only be done at a special time or on a special day, the sufferer might not get another chance for as much as a month to try again. I have seen individuals go into deep depressions because midnight rituals done badly on New Year’s Eve have spoiled the entire New Year. Because sufferers identify words, numbers, actions, etc., as having magical power to cause harm or bad luck, the magical compulsions which are supposed to undo them are frequently seen to involve the same elements. These rituals are generally used to cancel out or negate the ‘bad’ magical elements by employing their opposites, such as thinking of health-promoting words in response to thoughts concerning the names of illnesses. In terms of what can be done to remedy magical obsessions and compulsions, I recommend, as usual, the two-pronged approach of medication plus behavioral therapy. Antidepressant medications (Anafranil, Prozac, Zoloft, Luvox, Paxil, or Celexa) can provide a degree of symptom relief, reducing the obsessive thoughts and the urge to do compulsions sufficiently to allow behavioral therapy to help the sufferer overcome the rest of the problem. This is not to say that one cannot be successful without medication, however, it does improve your chances quite a bit. On the other hand, medication alone usually isn’t sufficient to do the job entirely. By behavioral therapy, I mean specifically, Exposure and Response Prevention (E&RP). The person in treatment is gradually encouraged to put themselves in a position for the bad luck or harm to occur, and then is discouraged from carrying out the avoidance or the magical ritual. It is not that magical thinkers totally believe in their magic. They don’t. They do, however, experience serious doubts and need encouragement to take the risks necessary to see that their beliefs aren’t justified. These are beliefs that are never challenged. Most of those with OCD generally don’t resist long enough to learn that their anxiety would pass even if they did nothing in response to the obsessions. In therapy, a listing, or hierarchy, is created in which all feared situations are ranked in order, usually on a one to ten or a zero to 100 scale. Patients work their way up the scale, gradually tackling more and more difficult items via homework assignments, or working with the therapist in the office or on field trips. No one is ever forced to do anything, and nothing is thrown at persons by surprise. Additional exposure to obsessive thoughts is accomplished via taped presentations, writing assignments, or selected readings. I have found the taped presentations to be of particular value. They are used several times per day, and increased in difficulty as the listener’s anxiety decreases with presentations. Despite what you may have heard, obsessions can be as effectively treated as compulsions. There are presently some small case studies from Britain which give evidence that this is so. Further scientific study will be needed to confirm this, once and for all, to convince the doubters. Some people require repeated exposures to feared situations, and some actually require only one. In this latter case, it is almost as if by facing something feared, the sufferer is breaking a ‘spell’. This is not to suggest that therapy is in some way like magic; it isn’t. Therapy requires persistent and consistent work. In this way, confidence is progressively increased, and symptoms are systematically eliminated. The person becomes habituated to the fearful thoughts to the point of no longer having to react to them, even if they do not completely cease. In uncomplicated cases, the process described above should take anywhere from six to twelve months. With individuals who habituate after only one exposure to each feared situation, the process may even be quicker. If you suffer from magical thoughts and compulsions, my message to you is don’t continue suffering needlessly. Help is available. Call the Foundation for a referral in your area. If you live with a magical thinker, remember: they are not crazy, just doubtful and anxious, and in need of support and encouragement. Fred Penzel, Ph.D. is a licensed psychologist who has specialized in the treatment of OCD and related disorders since 1982. He is the executive director of Western Suffolk Psychological Services in Huntington, Long Island, New York, a private treatment group specializing in OCD and obsessive-compulsive related problems, and is a founding member of the OCF Science Advisory Board. More of Fred’s work can be found on his website. Dr. Penzel is the author of “Obsessive-Compulsive Disorders: A Complete Guide To Getting Well And Staying Well,” a self-help book covering OCD and other obsessive-compulsive spectrum disorders. 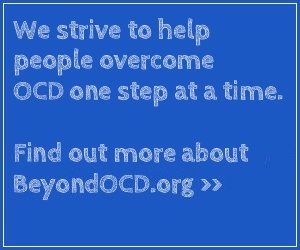 Beyond OCD's mission is to reach as many people affected by OCD as possible. We aim to connect people dealing with OCD and anxiety with the resources and information they need to thrive. BeyondOCD.org does not provide medical advice, diagnosis, or treatment. Please consult a medical professional before changing or commencing any course of treatment.